Apple Now Worth $1 Trillion—But What About 'Monkeybone'? Just 21 years after facing near-bankruptcy, Apple Inc. just became the first publicly traded company in history to be worth $1 trillion. This means that Apple’s market cap is roughly the same as the nominal GDP for Mexico, the world’s 15th largest economy, according to the United Nations. It’s a meaningless milestone in many ways, but it also got me thinking. Did you know that the 2001 dark fantasy film Monkeybone (starring Brendan Fraser and Whoopi Goldberg) isn’t on Netflix? It is not. 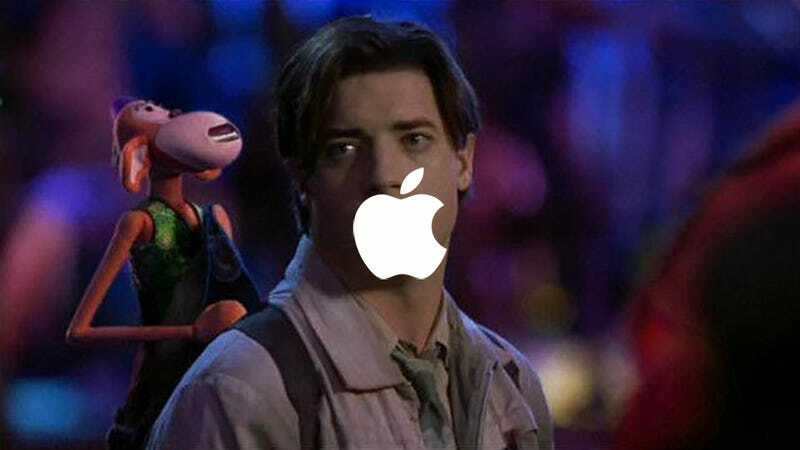 A lot of people look back to 2001—which is not only the year that Monkeybone hit theaters but also the year that the iPod hit stores—as a turning point in human history. This is undoubtedly true for global politics. The terrorist attacks of September 11, 2001, became the deadliest attack on United States soil since Pearl Harbor and launched the nation into an uncertain future filled with fear, war, and eventually, President Donald Trump. For consumer electronics, however, the year seemed more hopeful. Apple was slowly coming back to life after a $150 million investment from Microsoft in 1997 saved the company, and Steve Jobs rejoined it as CEO. Jobs ordered his engineers and a young designer named Jony Ive to create a music player, and eventually, they came up with the iPod. But the iPod was more than an mp3 machine. It served as the first glimpse at a new kind of gadget that could put impossible amounts of data in your pocket. The sleek and iconic design also introduced the world to a new era for Apple, one that would soon be defined not only be revolutionary products but also a skyrocketing stock price. When the iPod was released in October 2001, Apple’s stock price was hovering around $1.25 per share. On Thursday, it soared past $207.05 to become a trillion dollar company. But let’s get back to the 2001 black comedy Monkeybone, starring Brendan Fraser. Then just 32-years-old, Fraser was at the peak of his feature film career having just starred in a trio of legendary hits: The Mummy, Blast From the Past, and Bedazzled. In Monkeybone, Fraser plays an embittered cartoonist named Stu who creates a misbehaving monkey named Monkeybone. Stu crashes his car and ends up in a coma, but while he’s out, Stu’s spirit goes to a freaky underworld called Down Town, where Whoopi Goldberg plays a version of death and a young Rose McGowan plays a catgirl named Ms. Kitty. It’s a real hoot. Which makes it even more confusing that Monkeybone doesn’t have a permanent entry in the Netflix catalog. Sure, the film did not do well financially. Monkeybone had a budget of $75 million and brought in a little over $7.5 million at the box office. But it’s brimming with star power and pure entertainment. Monkeybone director Henry Selick also directed The Night Before Christmas, so the film’s dreamlike excursions through Down Town feature magical stop-motion animation and lots of laughs. Bridget Fonda, daughter of Peter Fonda, also plays a doctor at a sleep therapy clinic and Stu’s love interest. Even Chris Kattan is even in this movie. He plays a corpse. So despite a star-studded cast, the film’s poor box office showing might mean that Netflix could secure the streaming rights to Monkeybone for a good price. It all makes you wonder. Now that Apple is basically the most valuable company in the history of the galaxy, what will it do? Will it invent the next world-changing gadget and become worth more than even the United States of America? Or will it invent its own movie streaming service to compete with Netflix by offering the kinds of films that people deeply crave, films like Monkeybone. At present, Apple has $243.7 billion in cash on hand. It can probably afford to buy the rights to every single Brendan Fraser movie, including not only Monkeybone but also the 1992 paleo-fantasy comedy Encino Man. Then, Apple could just put those things on iTunes and charge people $9 a month or whatever to watch them. This is a great idea, and it’s honestly embarrassing for Apple that I even have to suggest it.